Glory, glory! A plate of poutine. While I am not a religious man, I believe that the first blissful bite of a perfect poutine is the closest one will ever get to seeing God. I fell into a deep love affair with the Quebecois delicacy during my years as an undergraduate in Montreal but I have been left unsatisfied ever since La Belle Province and I parted ways. However, Vancouver residents like me who adore the Holy Trinity that is cheese curds, fries and gravy finally have a place to worship. 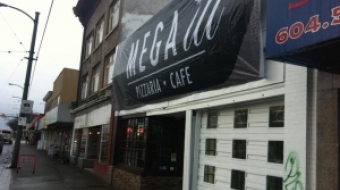 That’s right, Vancouver’s first legitimate poutine restaurant has arrived. La Belle Patate (Davie and Bute) features 30 variations of poutine, steamé hot dogs, smoked meat imported from Montreal and many of the delicious beers offered by Quebec’s award winning Unibroue brewery. Adorned with Montreal Canadiens paraphernalia and ‘Je me souviens’ license plates, La Belle Patate is the real deal. The Quebecois restaurant is owned by Montreal native, Pascal Cormier, who has been serving up steaming plates of poutine to hungry patrons at La Belle Patate’s Victoria location for over a year. Cormier said that when he explored Vancouver he was alarmed to find a vacuum in the poutine market. You see, while other Vancouver restaurants attempt to make the dish properly most unfortunately fall short of this goal. First of all, if its not made with cheese curds, it’s not a poutine. Any place that uses grated cheese instead of curds would be burned to the ground if they tried to repeat the crime in Montreal. However, the presence of curds alone does not guarantee a good poutine. The curds must be softened by the hot gravy but must also maintain their structural integrity. On one end of what I like to call the Curd Consistency Continuum you have the “squeaky curd phenomenon”. This occurs when the curds are not softened at all by the gravy and squeak in your mouth while you chew them. While some people like this sensation, it’s not for me. On the other end of the spectrum you’ll find curds that melt entirely, transforming your poutine into a soupy mess. The curds down Davie Street at Fritz’s European Fry House are an unfortunate victim of this affliction. “A premium curd is what makes a good poutine”, Cormier says, and so he has his curds delivered every Wednesday from a BC cheese company owned by a former Montrealer. La Belle Patate’s generously large curds are the perfect consistency, and while there are better poutines in Montreal, Vancouver’s best poutine spot would fit right in amongst the greasy spoons of Rue Saint Laurent. Walking into the restaurant it is easy to be overwhelmed by the plethora of artery-clogging options staring down at you from the black board. Before trying any of the more elaborate poutines, I’d start with a Classic, add an all dressed steamé hotdog if you’re feeling ambitious and wash it down with a bottle of Blanche De Chambly.